This statistic presents the orange juice imports of the United States from 2008/09 to 2017/18 and provides a forecast for 2018/19. 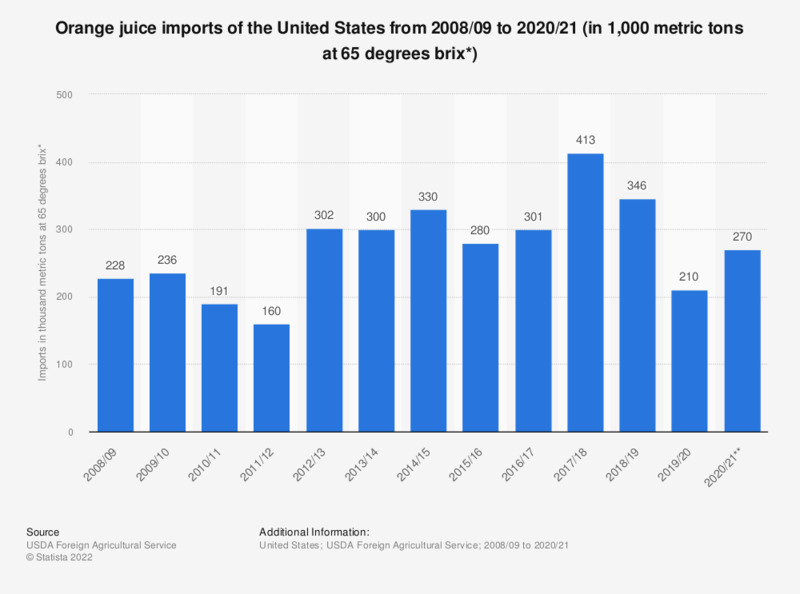 U.S. imports of orange juice was estimated to reach approximately 325 thousand metric tons at 65 degrees brix in 2018/19. * Degrees Brix (symbol °Bx) is the sugar content of an aqueous solution. One degree Brix is 1 gram of sucrose in 100 grams of solution and represents the strength of the solution as percentage by weight. For 2007/08 and after, one metric ton of 65 degrees brix equals 344.8 gallons at 42 degrees brix and 1,392.6 gallons at single strength equivalent. Split years refer to the harvest and marketing period, which corresponds roughly to October-September in the Northern Hemisphere. Import and export totals may not equal due in part to reporting anomalies such as those listed above. ** Forecast as of February 2019.